Located in a popular residential location which is close to both Exmouth town centre and train station is this well presented 2 double bedroom, mid terrace house that also has useful loft room. This gas centrally heated (from combi boiler) and uPVC double glazed property briefly comprises of an entrance hall, bay fronted living room that has an attractive gas fire feature, dining room and a modern fitted kitchen/breakfast that has been updated by the current owner and that boasts an excellent range of integrated appliances. On the first floor are 2 double bedrooms and a large family bathroom that has both a bath and separate shower. There is also a very useful loft room that is currently used as a double bedroom and that is accessed via a staircase from the first floor. 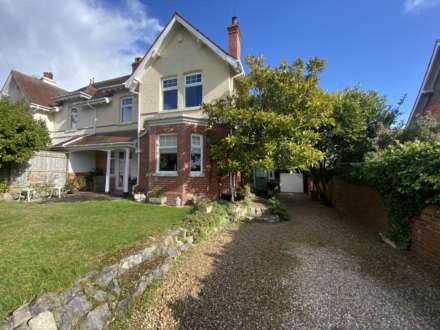 The property also benefits from an enclosed front garden and a decked garden to the rear. Being within walking distance to schools and a range of amenities, this property should be viewed internally to fully appreciate what it offers. A lovely room with a walk in bay window to front. Focal point of an attractive, inset, woodburner effect fire with a paved hearth. Wood mantle above. Radiator. TV point. Coved ceiling. An extended room which has been updated by the current vendor and that now comprises of a good range of floor standing and wall mounted cupboard and drawer, gloss white, storage units with solid work surfaces above. Window to side and French doors to rear leading out to the rear garden. The kitchen has been finished with under unit lighting and LED lighting to the plinths. Matching curved breakfast bar. Excellent range of integrated appliances which includes a fridge, freezer, dishwasher and a washer/dryer. also built in is a 4 ring electric induction hob with tiled splash backs and a filter hood above and an eye level electric oven and grill to the side that also has a combi oven/microwave above. Concealed, wall mounted, gas fired combi boiler that supplies the gas central heating and the domestic hot water. Inset ceramic sink with a swan neck mixer tap and tiled splash backs above. Vinyl flooring. Upright radiator. Wine rack. Useful storage cupboard recess. Dual aspect room with obscure glazed windows to side and rear. Fitted white suite comprising of a panelled bath with tiled splash backs above to splash prone areas. Walk in shower with tiled splash backs, shower curtain and an electric shower. Low level WC. Pedestal wash hand basin. Radiator. Vinyl flooring, Coved ceiling. Useful built in storage cupboard. A lovely size room with a walk in bay window to front and a further window to front. Radiator, Painted floorboards. Excellent range of built in storage including wardrobes and overhead storage. Useful understairs recess. Window to rear. Radiator. Built in storage cupboard to chimney recess. A excellent room which is currently used as a double bedroom that has a velux window to front. Part sloped ceilings. Storage recess. Access to eaves storage. To the front of the property is an enclosed garden that is laid mainly to shingle with a shrub bed border to the front and one side. A block paved pathway leads to the front entrance door and across the front of the property. Dwarf walled boundaries. Timber garden gate. To the rear of the property is an enclosed garden that is laid to decking, ideal for outdoor dining and sitting during finer weather. Outside water tap. Wall boundaries. Timber garden gate to rear that allows for rear pedestrian access via a service lane.